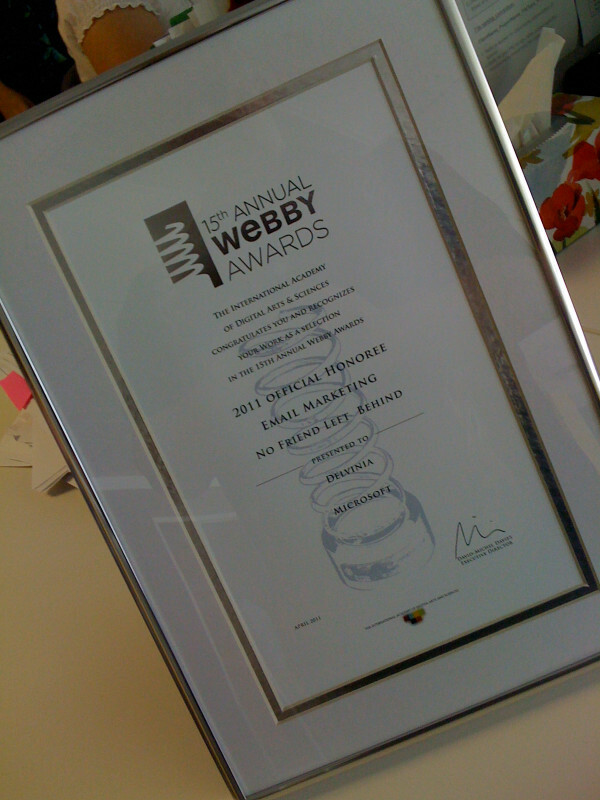 Delvinia’s official Webby Awards certificate arrived at our King Street West offices this afternoon! Earlier this year the International Academy of the Digital Arts and Sciences announced that our work for Microsoft Canada’s No Friend Left Behind campaign was being recognized as an Official Honoree in the Email Marketing category at the 15th annual Webby Awards. The marketing campaign—which Delvinia designed to promote Microsoft’s launch of Window’s Live Messenger for the iPhone and iPod touch—is based on a creative concept that highlights the critical moments when you need the expertise of the friends on your IM list the most, all while poking fun at the fact that different friends meet different needs in our daily lives. The app encourages users to download a badge that best describes their personality—examples include stylista, foodie, wingman and party pro—and then add it as their Messenger, Facebook or Twitter profile picture. Participants are then challenged with getting their friends to vote for them to unlock higher level badges and gain street cred. For more information about the project, please feel free to read our No Friend Left Behind case study.